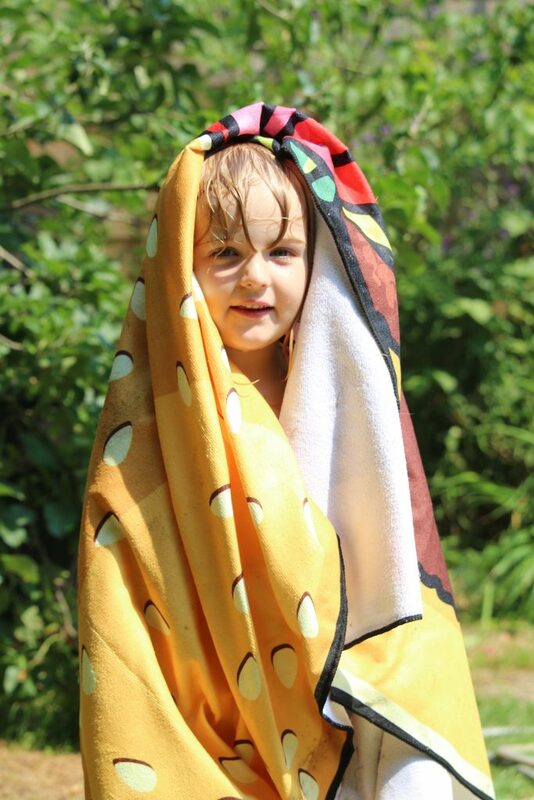 It may have escaped your notice (if you happen to live in a fridge) but it’s hotter than an oven out there. Keeping cool in the house has been almost impossible, so into the garden it is. The paddling pool is always a firm favourite during a heatwave; for about seven seconds, as long as the water isn’t too cold. 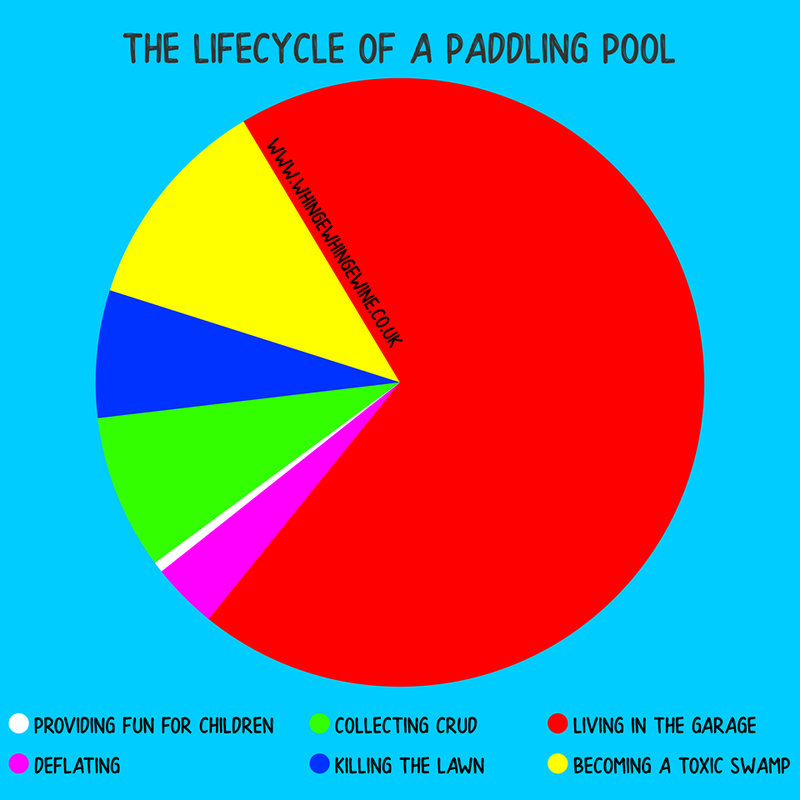 Click here to see a post all about the lifecycle of a paddling pool. It’s a goodun. As an alternative, friends have suggested sprinklers. They don’t turn into toxic swamps overnight, there’s no ring of dead grass on the lawn and your children would find it very hard to drown each other using one. 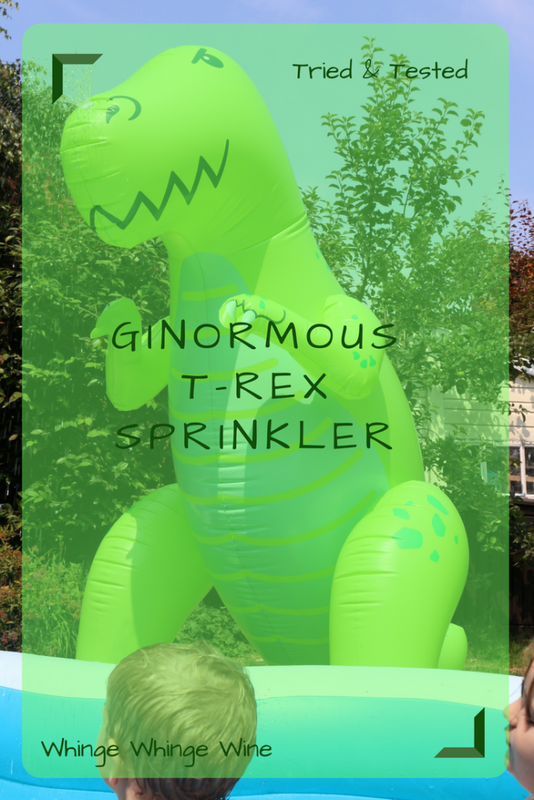 Never one to do things by halves, I was offered a Ginormous T-Rex Sprinkler and thought yes! 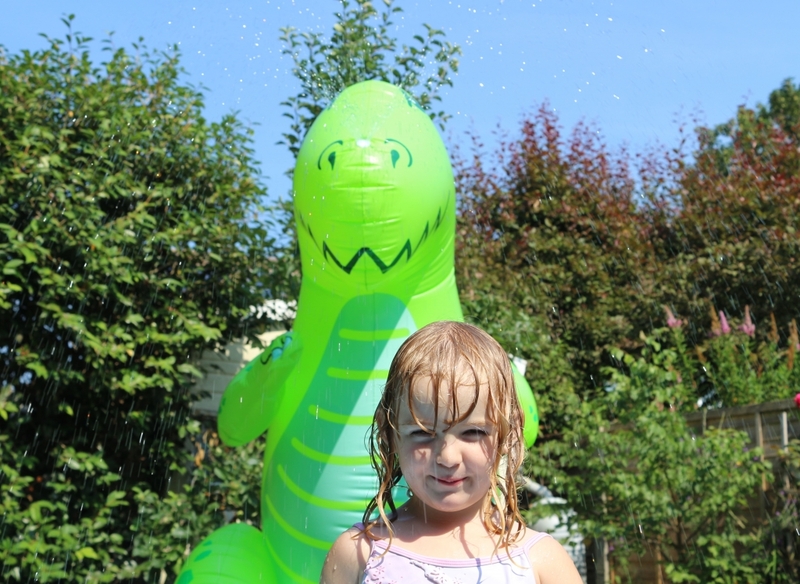 A six foot inflatable dinosaur sprinkler; that’s the one I – I mean the kids – need. 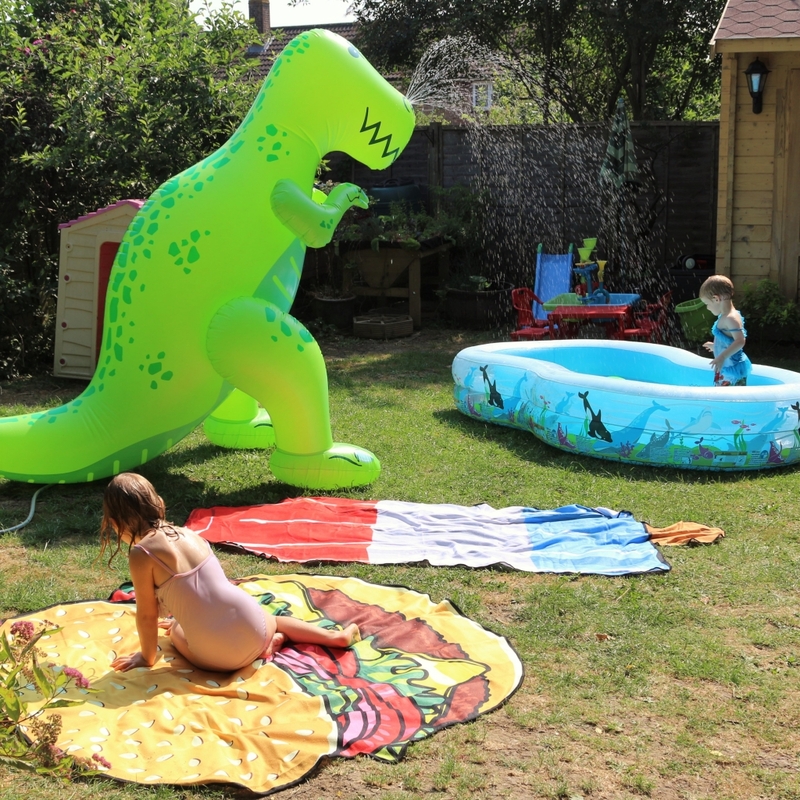 And so, the lovely people at Menkind send me a huge inflatable dinosaur for the garden. 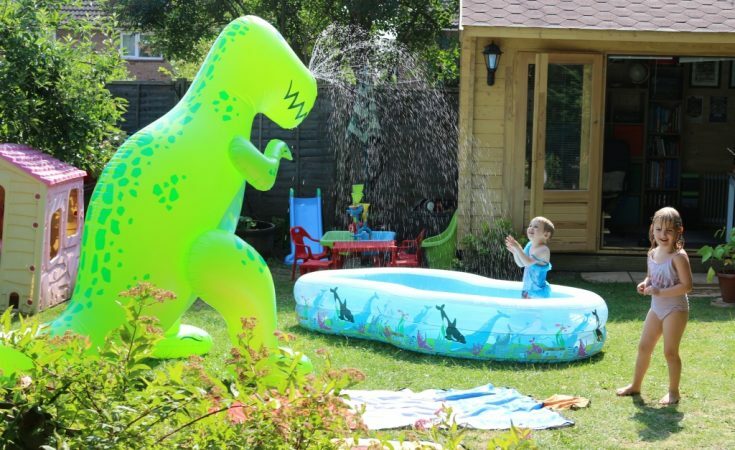 The Ginormous T-Rex sprinkler is made from durable vinyl. Boxed up, he (I’m assuming from here on in that he’s male. It’s probably his lack of aim) wasn’t actually that big. I doubt I’ll ever manage to fold him that well again but he should be fairly easy to store. 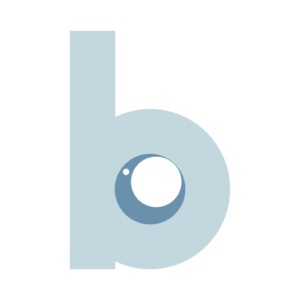 To use him, just pump him up using an electric airbed pump – it doesn’t take long – and then attach the hose to the water inlet. 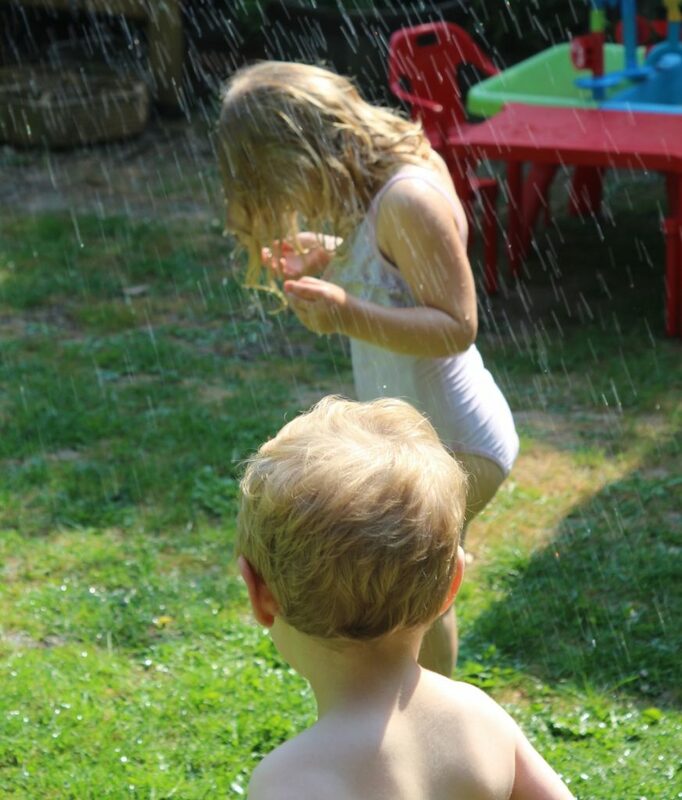 Turn it on, and voila – sprinkly water garden fun. 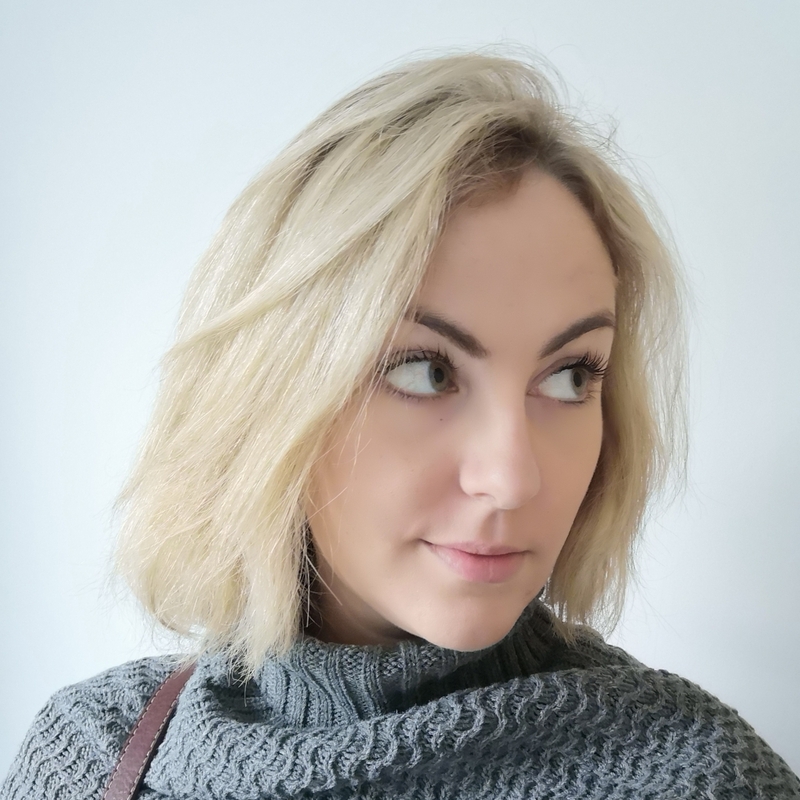 I had a bit of difficulty at first as unfortunately he wasn’t dispatched with the right adaptor for my hose – a bog standard Hozelock one – as he should be, and I couldn’t fit the hose on. These things always happen to me. For a while I tried in vain to attach my UK hose to a US inlet. Anyway, being a proper little detective, I worked this out and let them know, and they soon sent me the bit I needed. 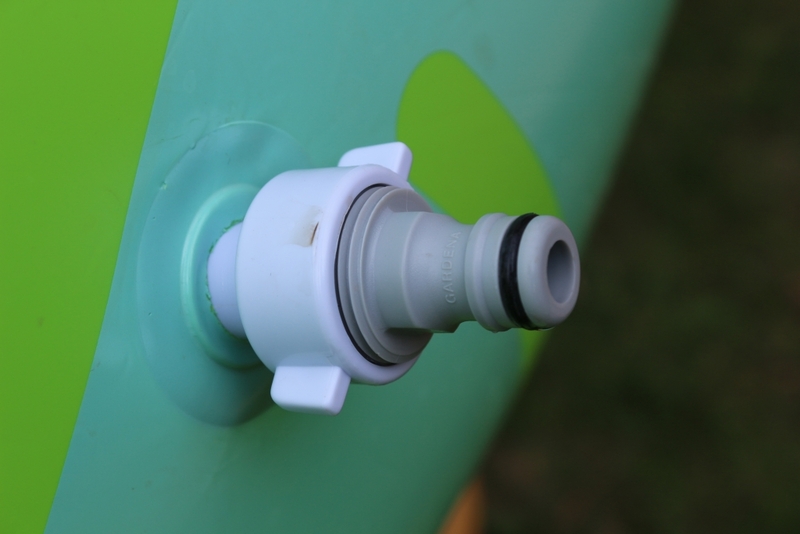 If you can’t work out how the bobbins to connect your standard UK hose to your ginormous inflatable dinosaur sprinkler, then this grey bit is the piece you need. Stick the black washer underneath before you screw it on. That snaps into your hose outlet, and you’re good to go. 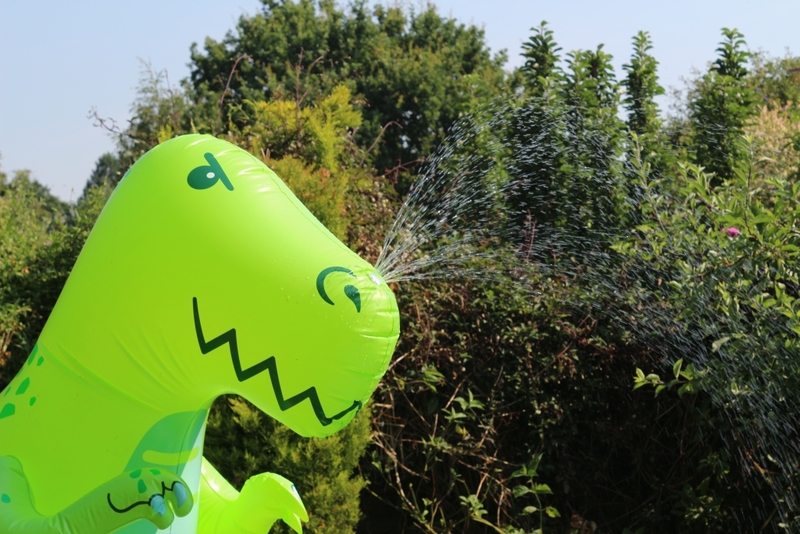 The t-rex sprinkler, once inflated, does stand well over six foot. Like a t-rex should really. They were not lying. The hose attachs at the bottom and depending on how much you turn the tap on, he can spray a good few feet from his nose! 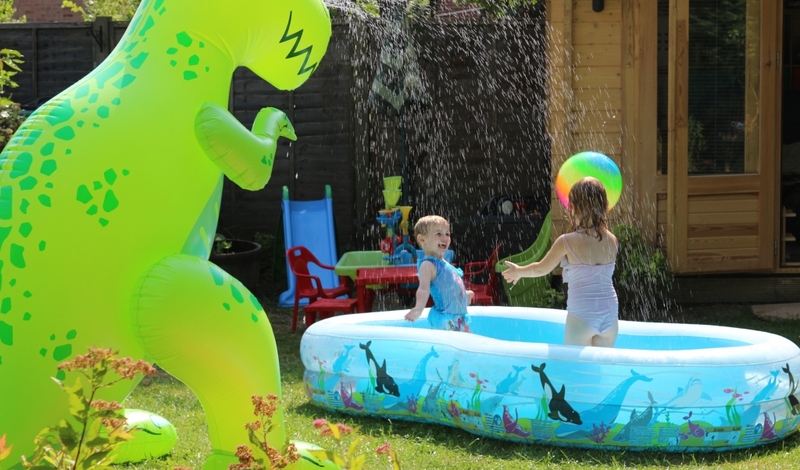 After watering the garden with him, and one of my children being brave enough to actually stand under the stream of water, we decided that we would blow up the paddling pool so that he could squirt his water into there while the children danced underneath. I can’t imagine a better way to spend a day in the garden. The children (one of whom is certifiably dinosaur-mad) thought he was brilliant. The paddling pool filled up at a nice pace (although obviously this can be adjusted via the tap’s pressure) while the children shrieked with delight. 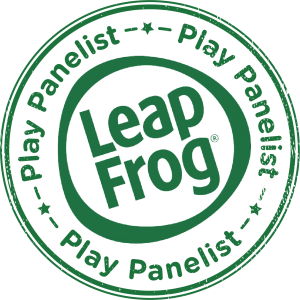 The children thought he was fantastic, and he was definitely a conversation starter when we invited friends over to play. Roarsome! To deflate him, you simply unscrew the valve and let him collapse. Don’t watch, it’s too sad. 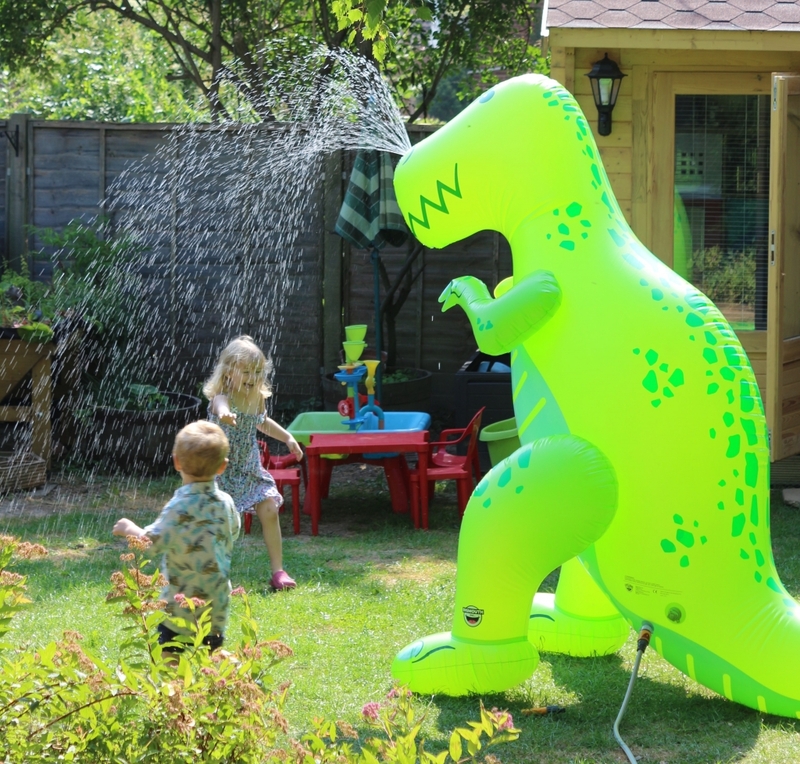 If you think you need a Giant Inflatable T-rex Sprinkler in your life (and FYI you do) he retails at £69.99 on Menkind here. Follow Menkind on Twitter, Instagram and Facebook or find out where you can find a bricks and mortar store. 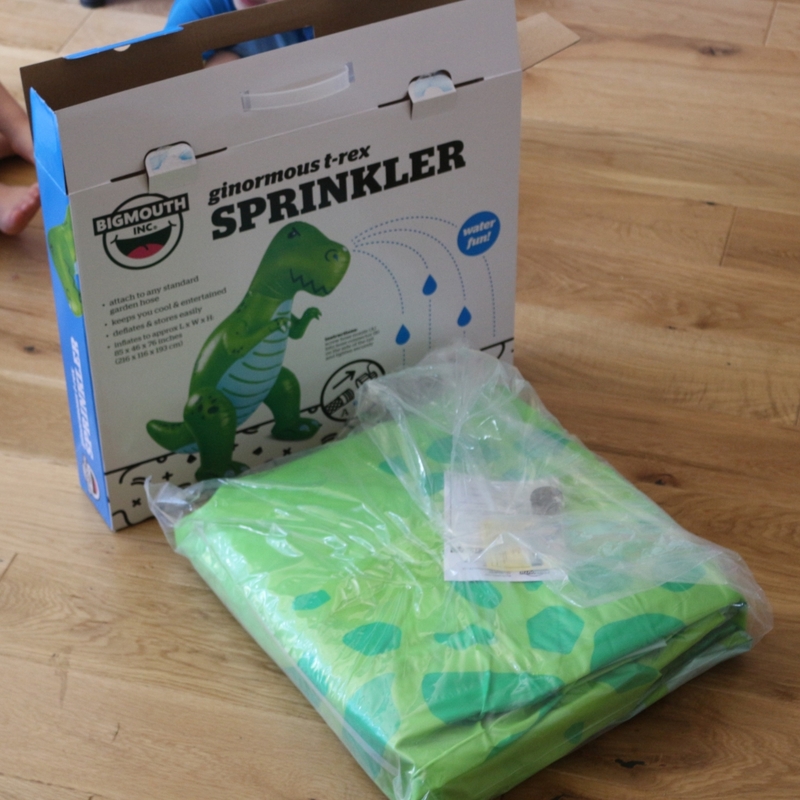 I was sent this inflatable dinosaur sprinkler for free by Menkind, but the words and pictures are all mine.